Source of Earliest Record: Yaoxue Dacidian. 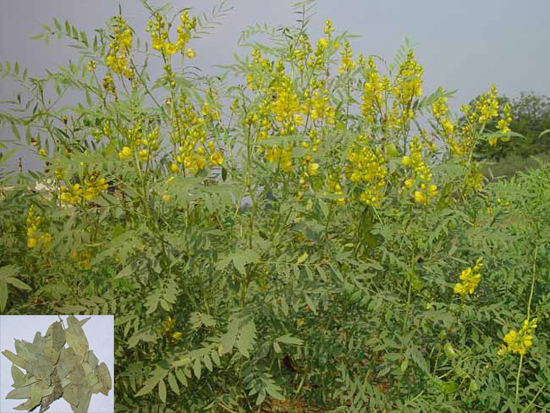 Folium Sennae is produced chiefly in India, Egypt, and the provinces of Hainandao and Yunnan in China. Collected in September, the leaves are dried in sunlight after cleaning and used unprepared. Functions: To purge feces downward. Indications & Combinations: Constipation. Senna leaf (Fanxieye) is used alone, or it is used with Immature bitter orange (Zhishi) and Magnolia bark (Houpo). Dosage: 1.5-3 g for a mild effect, 5–10 g, for a drastic effect. Steep the herb in boiling water for an oral dose or decoct in water longer than other herbs. Cautions & Contraindications: Contraindicated during pregnancy, menses, and lactation. Overdose can result in abdominal pain, nausea, and vomiting.